Kick to the head by a moose? Talking about the skull on the right. I’ve got a skull from a 6 1/2’ blackie boar that has 2-holes on one side of its head, looks like old healed over 30 cal bullet holes. Zygomatic arch is busted up and healed too.. It’s left ear was missing when I shot it. I figured when it was a younger bear that it just about got its ticket punched by another bigger bear and survived it..
Not sure why the pictures got deleted but I'll try it again. I wonder what his skull looks like..
some pretty interesting damage/growth there, what did it look like before you skinned it. Completely normal on the outside. I would have never guessed it had the injury until I skinned it. strange no indication but what a beautiful colored wolf. Have seen a few damaged skulls as well wolf that was either bitten or kicked in top of head, cougar with damaged arches probable kicked and broken and mountain goat split down the center and one side lifted about an inch so horn was out side ways the skull then fused back together. Amazing animals can survive stuff like that. If that happened to a human (had their head/skull based in and their cranium busted into pieces) they would for sure be in the ICU for weeks if not months and most assuredly they would have a hard time living a normal life after something like that. Yeah, in some of the other skulls I've preserved over the years I've found bite marks and small holes from injuries before but nothing quite this severe. This appears like a severe compression fracture occurred at some point in its life and most likely there was significant brain damage as a result. But surprisingly it healed entirely. And the wolf with very healthy and in good shape so it didn't appear to affect him too much mentally. Do you clean/taxidermy your own skulls? Yep. I'm not a licensed taxidermist or anything but I've cleaned lots of skulls. Mostly just my own, but I've also done some for other people for a small fee. It's not very hard. I'm doing about a dozen right now. I wonder if it is the result of getting hit by a car or truck. also seems to be a bit of damage on the nose wonder if he/she stuck its head in a conibear and was able to pull it off. Whatever happened at the back of the skull it looks like it caused the jaw muscles to become detached and when they reattached they did so in a different location creating calcification, no doubt happened early in development. Was there any unusual wear on the teeth? Pretty amazing. Great job on cleaning it up and bleaching it, what bleach are you using? Possibly, but I doubt it. First of all, it's doubtful a wolf would be foolish enough to stick it's head in a conibear. I've never heard of anybody catching a wolf in a conibear but you never know. I guess it's a possibility. Yeah, I think it's interesting that the saggital crest grew back off to the side. It must have been really difficult and painful for it to eat solid for a really long time. Nothing unusual about the teeth at all. In fact, the teeth are in perfect shape. I use hydrogen peroxide to whiten my skulls. Here’s a bull caribou skull from last fall. Seemed perfectly healthy. Didn’t notice any abnormalities until I pulled the skull out of the cooker. The hole goes clear through above his teeth then comes out the roof of his mouth. The crack in front of his teeth goes almost to the natural split on the top of the center of his skull. Can anyone say "headache?" Must have been a tough life. This old guy must have fallen, he had a dog leg between his knee and ankle also. Wow! What an old timer. He really needed to go see the dentist bad. I bet he was a grumpy old cuss. 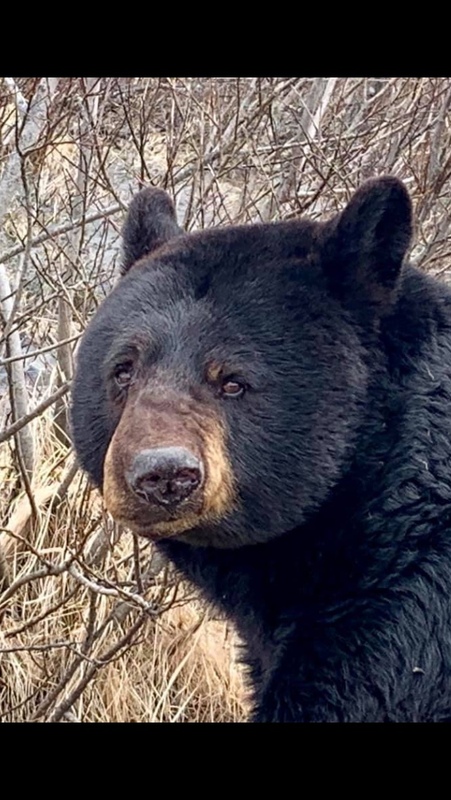 A hunter of mine once killed an old bear on Kosina Creek that had been hit so hard at a young age that his isomatic arch was flat and his jaw jutted to one side.